Last Fall, we introduced The White Collar Therapy Show and Podcast as “therapeutic entertainment for career-minded professionals.” The show was a first step towards the idea of a community-driven networking program for like-minded individuals. Today we are pleased to announce the introduction of White Collar Therapy Group Coaching Webinars for Business Owners and Leaders as the second addition to this initiative. 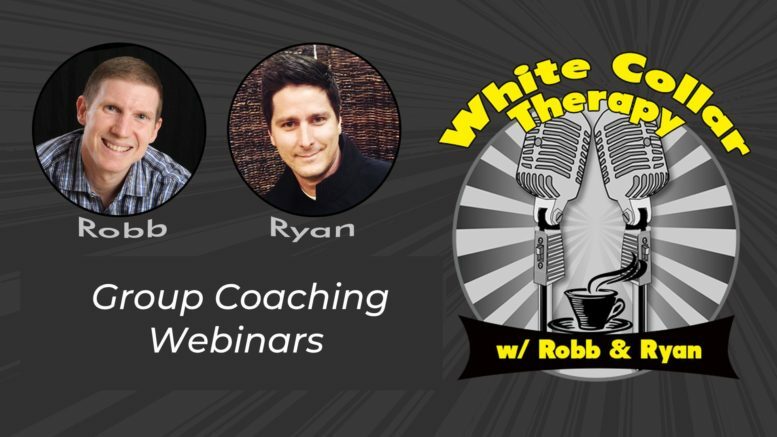 The addition of group coaching webinars, which comes in the third season of the show, gives viewers and listeners the opportunity to benefit from White Collar Therapy beyond just the show. It creates the benefit of membership and will offer a more dynamic experience for these members. In the webinars, Robb will explore specific chapters from his book, breaking down the curriculum in a tangible manner, giving attendees the experience of learning from Robb’s teachings through inspiration. The webinars will also feature special guests who can provide contrast on these ideas, introducing members to other business leaders and coaches, and vice versa. The webinars will also include an interactive Q&A segment. Get the official press release here. Go here now to sign up with White Collar Therapy. By registering, you will become a free member of the WCT community and initiative. As a community member you will have the opportunity to attend WCT Group Coaching sessions as they are conducted, and you will be granted access to the complete recordings of these session as well. NOTE: You MUST BE SIGNED UP to participate and/or access these group coaching sessions. There is no cost or obligation to register. You are not required to attend any of the events and you may unsubscribe from the coaching sessions at any time. Register here to get started right away as a free WCT Member now!